Concerts at St. Mary’s Penzance and Truro Baptist Church were give in the same week near the end of August. Good attendance in Penzance for a short lunchtime programme and well-received. Our first visit to Truro Baptist Church raised nearly £200 for the Kenyan Children of Hope. A lovely venue and great welcome and feedback. We had a very nice evening and concert at Mount Charles Methodist Church on Thursday 22nd February raising £136 for the church funds. After a successful and well attended concert on July 30th 7.30 pm at Tregaminion Chapel of Ease we headed to Fowey for a concert in aid of Cornwall Hospice Care. It was the 10th Anniversary of our first performance, and a very successful evening raised £400 for the Hospice. A most enjoyable summer tour! Our final concert of 2014 was at Sennen Church, as part of their Annual Music Festival. A most enjoyable and well supported evening thanks to the church organisation, and June Hicks in particular, who again provided us with sumptuous refreshments between a rehearsal and the performance. 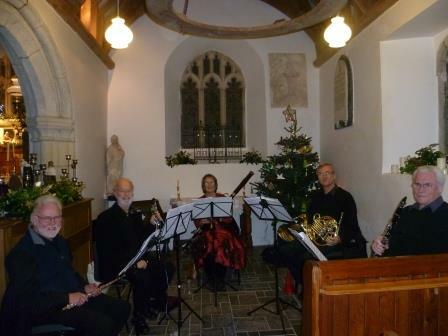 Our performances at Tregony and Perranuthnoe were very successful and raised money for the respective churches maintenance. Judith Bailey was part of a large audience at Perranuthnoe to hear her composition ‘Stems from Cornwall’. A lunchtime concert at St Mary’s Penzance on Wednesday 27th August was well attended. A light classical programme including Tchaikovsky, Handel, English Folk Tunes, and Dvorak as well as a Vaudeville selection and extracts from a modern composition by Christopher Ball called ‘Scenes from a Comedy’ was well received. Concert on Friday March 21st at St Teath Church was very well received by a fairly small, but appreciative audience and raised funds for the upkeep of the building. We are available for concerts, charity events, weddings, background music etc. Our repertoire varies from classical to light and popular music, and even some jazz. St Austell Parish Church Hall on Friday, October 25th at 7.30, in aid of the Soroptimist Club. 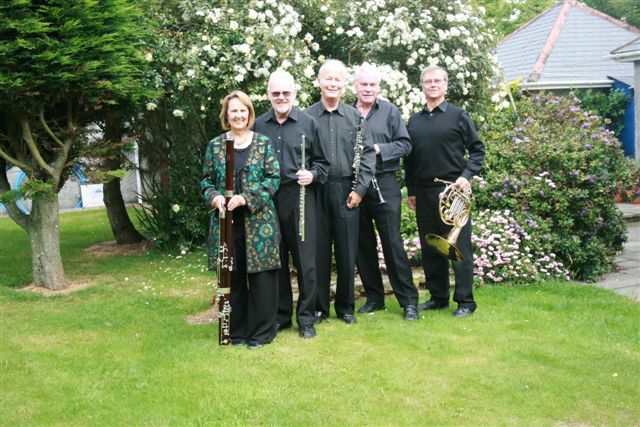 St. Cuby Church, Tregony Thursday November 14th 7.30 p.m.